Adolescence is a tricky period in one’s life. One experiences changes in the body while having to deal with the stresses of trying to achieve good grades at school and appeasing one’s peers who may (or may not) be at a more advanced stage in their hormonal growth. Carol Morley’s The Falling deals with some of the issues that many girls go through as part of their adolescence. Best friends, Abby (Florence Pugh) and Lydia (Maisie Williams) lying on the grass in their school uniforms, drawing a tree for their art class. The film is based in a village in England in 1969 and centres round Lydia (Maisie Williams). She lives with her agoraphobic mother (Maxine Peake) and her ill-educated brother (Joe Cole) in a small, rundown house. While Lydia’s life is not great, she has a good group of friends at a private, all-girls school. One of whom, Abby (Florence Pugh), is exploring her sexuality. However, as Lydia is coming to terms with her developing body, she begins fainting inexplicitly. Soon, Lydia’s friends start fainting too. But the school administration does not take the matter seriously, not believing that it is an epidemic. Lydia tries her hardest to convince the administration that something is wrong with her and her friends. 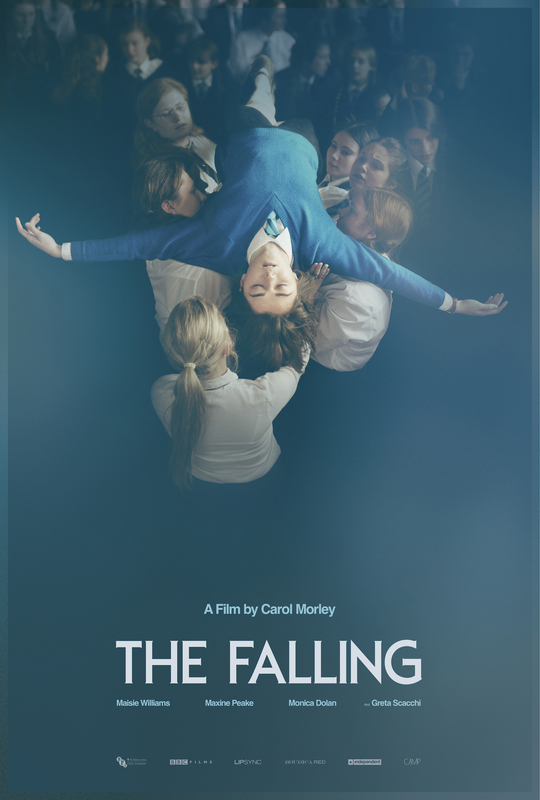 The Falling is an innovative and interesting movie that has been well directed by Carol Morley. On a small budget, she has put together a solid film with a fine balance of charm and sincerity. Devoid of special-effects en masse, Morley relies on cinematography to create the wonderful ambiance of a repressive all-girls high school in a small, provincial area, with some odd sorts of people (and behaviour) that can be the norm in such communities in 1960s England or even today. 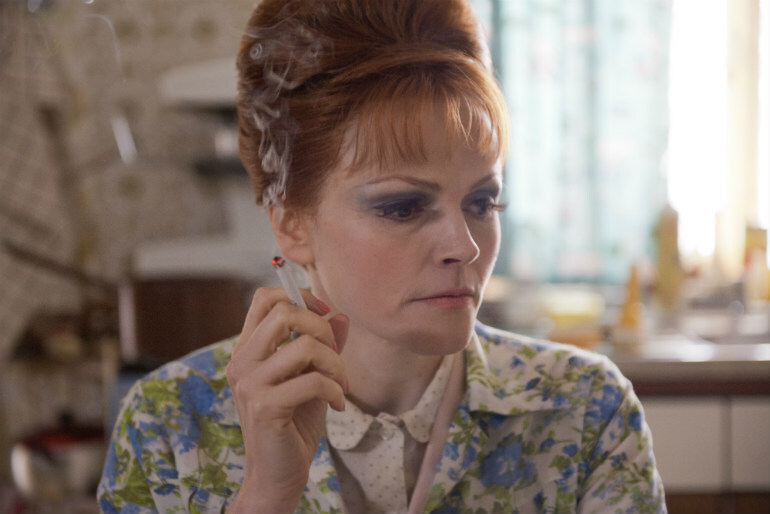 Eileen (Maxine Peake) smoking. She is Lydia’s hair-dresser mother who suffers from Agorophobia. Other elements of The Falling that work in Morley’s favour are the dialogue and the acting. Both are very good, honest and plausible. One can imagine (in the main) adolescent girls, and the adults that surround them, behaving in the manner that the film portrays. In the lead role, Maisie Williams is terrific and captivating to watch. 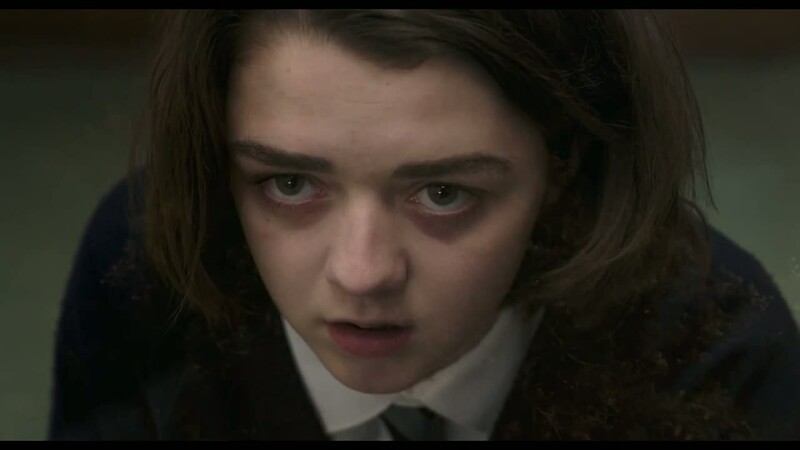 Like Arya Stark, her character in Game of Thrones, her character in The Falling is strong-willed and tenacious (if more vulnerable, messed up and curious). But Williams, here, gives a more rounded performance as Lydia is more vulnerable, messed up and curious than Arya Stark is ever likely to be. The rest of the cast are not given the time or detail afforded to Lydia/Williams’s character. Nonetheless, they all play their roles strongly and with a genuine naturalness that is highly believable. Yet, for all The Falling’s genuineness and believability, it is a strange film. Its central premise has echoes of the hysterical contagion/the June Bug Epidemic that affected an American textiles factory in 1962; only, The Falling probably exaggerates the issue. Curiously, the fainting syndrome in the movie becomes so normal (and repetitive) that characters and audiences alike fail to bat an eyelid after a while. This is an abnormal reaction because the normal response to seeing someone faint is either to run over to the person who has fainted, or to call for help/an ambulance. Lydia looking terrible, haunted even, as she tries to convince her teachers that the fainting epidemic is real and that she and her friends are not making it up. This leads on to the main issue at the heart of the film: is the fainting an epidemic among the girls? Is it something celestial or paranormal? Or is it just frustrated, adolescent girls crying out for attention (and an outlet) in a repressive environment? These questions are very pertinent as they can give viewers an insight into the stresses that adolescent girls often endure in high school. That is if one does not focus too much on certain, side-matters in the film that are remain ambiguous right to the end. Or if one can get past the perplexing, out of sync music. Or if one does not get an epileptic fit from the fast-flicking flashbacks that are unfathomable and add nothing to the plot. Nevertheless, if one can ignore these issues, one can greatly enjoy The Falling. All-in-all, The Falling is an entertaining film in a stimulating and peculiar way. The movie may not resolve all its issues. But it is well-shot, has wonderful cinematography, and has marvellous acting to go with a good, solid script that brings out the best in Maisie Williams. Where The Falling succeeds most is in showing viewers the problems and pressures that most teenage school-girls face, even if it is in an environment and in a time slightly removed from conventional stories on the subject. Carol Morley must be credited for this because her film is original and demonstrates the dangers of repressing adolescent girls too much.